Integrative Biology held its spring potluck and BBQ on June 6, 2018. Sally Hacker, Acting Associate Head, presented the Castor canadensis Award for Faculty/Staff to Lindsay Biga in recognition of her leadership and commitment to the newly formed Equity, Justice and Inclusion committee. Brian Tanis received the Castor canadensis Award for Graduate Students for his diligent work in organizing the J.C. Braly Natural History Collection specimens. This will increase the collection's accessibility for research, teaching, and outreach to the community. Mike Blouin, IB's Graduate Studies Chair, presented David Taylor with the Paul & Mary Roberts Fellowship, which recognizes academic excellence in graduate studies related to evolutionary biology. Paul Roberts, Professor Emeritus of Zoology, and his wife, Mary, were in attendance to personally congratulate David. 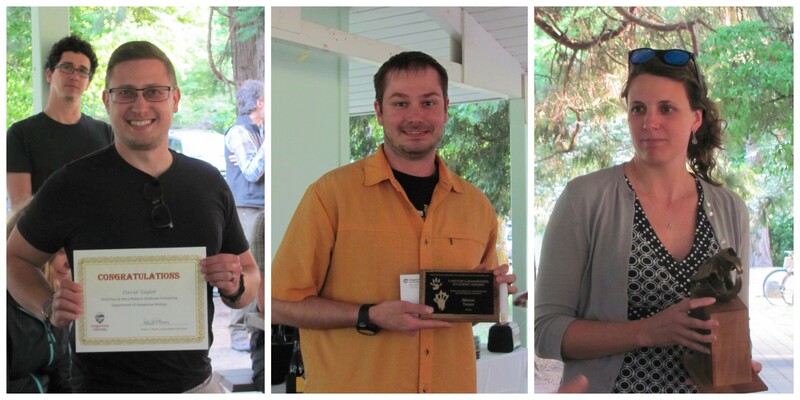 Congratulations to Lindsay, Brian and David!